With a deep sigh of relief, I just posted off my entry for the Glasgow School of Yarn Design Competition. I don’t think I’ve ever done so much knitting in such a short time period. 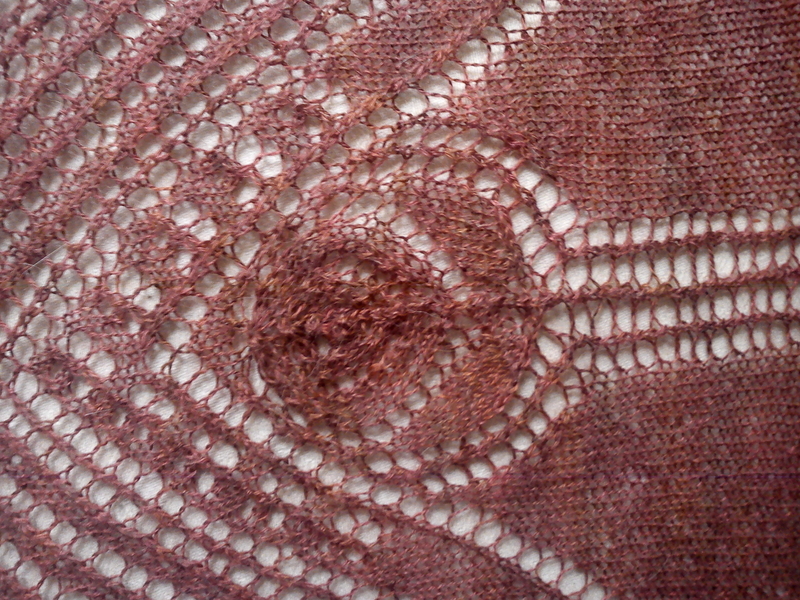 Over 300 yards of laceweight, on 3.0 mm needles, over the course of two days. Rather heavy going. My neck is stiff and my hands feel like they’re about to fall off, but I finished it in time! And, just as importantly, I managed to assemble all the charts and instructions into a nice-looking pdf. The one thing niggling at my inner perfectionist (who has mostly been mercifully quiet since I realised I was running out of time) is this: I had wanted to continue the edging (which is knitted at the same time as the rest of the shawl) over the top of the shawl. Seems like this should work, no? Short rows at one corner, then do the edging knitted on across the top, instead of a BO. For some reason, my brain could just not compute how to juggle all the numbers and get the short rows to work properly (and the number-juggling is usually my favourite part). When I get the sample back, I may have to have another go at it. Might be easier without a deadline looming ominously over my head. I kept my sanity during my two-day lace knitathon by listening to lots and lots of my favourite progressive rock. 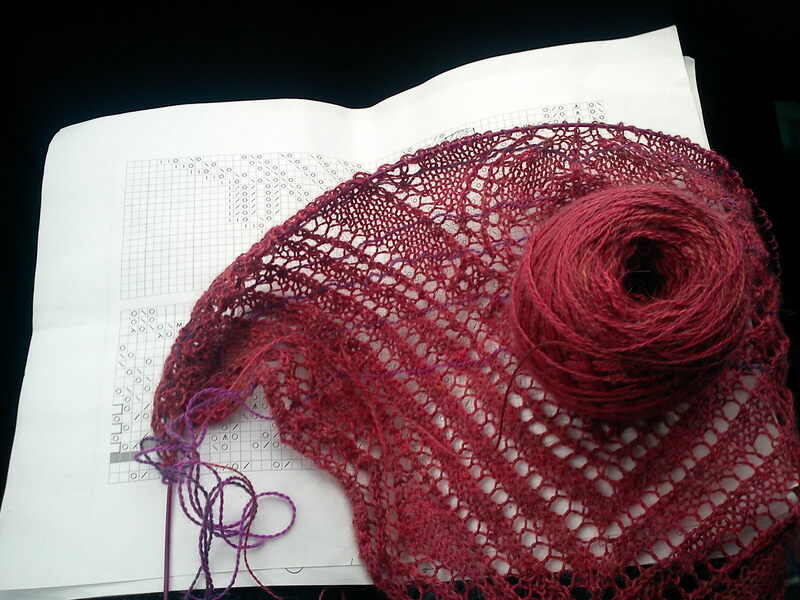 There is something about prog that goes very nicely with lace-knitting. That does seem like a rather bizarre comparison, I know. Perhaps what I mean is – I get the same thing from listening to prog that I get from knitting and designing lace. An appreciation of complexity, depth, structure, beauty, thematic movements (I shall stop before I get too pretentious). Funnily enough, I just realised that the song I have been listening to the most whilst working on this shawl is “La Rossa” by the incomparable Van Der Graaf Generator (isn’t that Italian for ‘rose’…?). Coincedence! For the past month or so, I’ve been working on an entry for the Glasgow School of Yarn design competition. The brief is to design an original knitting or crochet pattern inspired by the work of Charles Rennie Mackintosh. Now, I am a huge fan of Art Nouveau and Deco style, and as soon as I heard about this, I knew had to enter. I had half a skein of lovely yarn sitting in my stash and just waiting to be made into a small shawl – Abstract Cat alpaca silk laceweight. (A funny story about this yarn… last year, I was knitting a lace scarf for a Christmas present. I slept through my alarm one morning, woke to discover I was running late for work, shoved my knitting in my rucksack and ran out of the house and down the street. Got about halfway towards the bus stop before being pulled to a sudden halt. I turned around and witnessed yards and yards of laceweight yarn, strung across the street; I had put the knitting in my bag but left the ball of yarn in the house! It’s a testament to the strength and resilience of this lovely yarn that it didn’t snap…). The main problem is: I am my own worst enemy as a designer, sometimes. Particularly when working to a competition deadline, it would seem. I guess I’m a bit of a perfectionist, and I also I have a bad tendency to plough on regardless, even when I know I’m going to have to rip back and change something. Because of the construction of this shawl, starting with just a few stitches at the tip and then increasing on every other row, mistakes/changes at the beginning were easily fixed. But now it’s getting bigger and bigger, and I just had to rip back several hours worth of work. Not even to fix a mistake, just to make a design change! I only have a few days left to finish the sample before the deadline, so I suppose I’m just going to have to get my inner perfectionist to shut up, and make a vow to myself not to frog again… anything I knit from this point on is staying in the shawl, whether I like it or not!